LARAEC will provide seamless pathways to workforce and higher education that are efficient, comprehensive, student-centered, and regionally relevant. LARAEC will sustain, expand, and improve adult education. Los Angeles Community College District. Partners include other adult education stakeholders in the Los Angeles area including Workforce Investment Boards, the City of Los Angeles’ Workforce Development Department, the Los Angeles Public Library, and several community-based organizations. In 2015, LARAEC stakeholders identified regional adult education needs using Assembly Bill 86 funding, culminating in the Regional Comprehensive Plan. Subsequent legislation through Assembly Bill 104 provided Adult Education Block Grants to 71 consortia throughout California. These AEBG funds provide consortia with the resources to implement their respective plans. ANNUAL LARAEC CONFERENCE: Over 450 attendees convened for the 2017 conference Accelerating Student Transitions to the Workforce and Postsecondary Education which showcased two plenary speakers and workshop presentations tailored to the needs of LARAEC faculty, administrative staff, administrators, community and industry partners, and students. The 2018 Conference, Don’t Stop Believing: Journeys to Student Success took place on March 10, 2018 at the Sheraton Universal Hotel with keynote speaker Dr. Kevin Fleming. 2018 Workshop PowerPoint presentations and the keynote speech PowerPoint are posted here. SUBJECT MATTER EXPERT WORKGROUPS: Subject Matter Experts representing all member districts collaborated on strategies delineated in LARAEC’s Regional Comprehensive Plan and in the consortium’s Annual Plans. 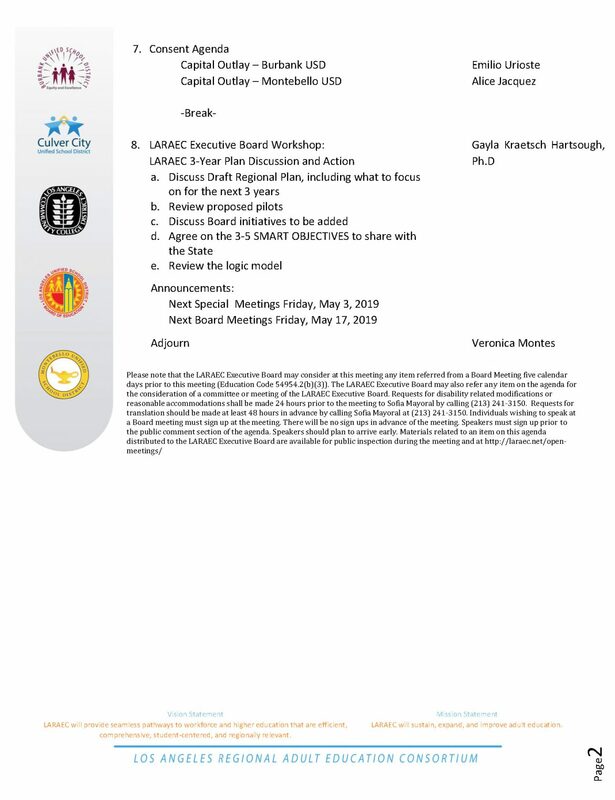 Deliverables include strategies for aligning and articulating curricula, accelerating student transitions, creating viable pathways, and increasing student supports for ESL, ABE, ASE, CTE, and Counseling program areas. PILOT PROGRAMS: LARAEC oversaw 70 pilot programs that address the AEBG strategies of seamless transitions, student acceleration, student support, shared professional development, and leveraging resources. Included among these pilots are courses that incorporate Integrated Education and Training and blended/ hybrid courses for ESL, ABE, ASE, and CTE. Bridge transition programs and student counseling services were developed and evaluated. The Los Angeles Public Library and LARAEC are collaborating on leveraging resources to better serve the educational needs of area residents throughout the Los Angeles region. LARAEC continually searches to collaborate with regional community and industry partners. 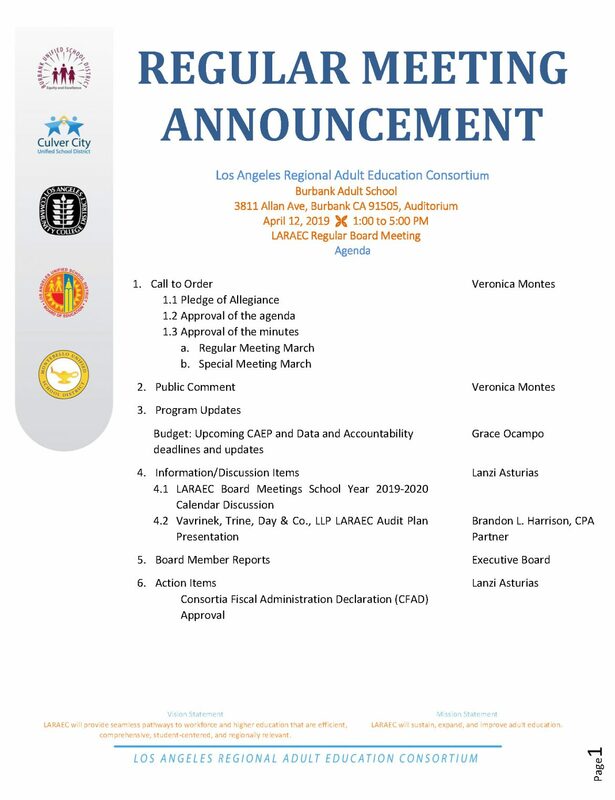 For more information please contact Program Director Lanzi Asturias at lla64551@lausd.net or at (213) 241-3167.